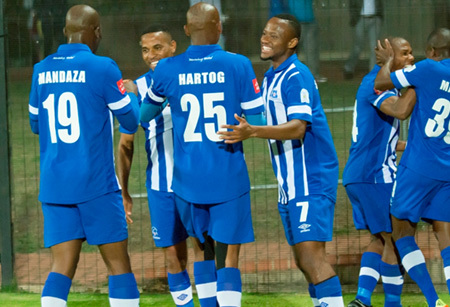 Maritzburg United made it a night to remember in Pretoria when they beat Gordon Igesund’s on-form SuperSport United side 4-1. The victory in Attridgeville on Wednesday night was sealed via a Terrance Mandaza brace, with Mondli Cele and Mohammed Anas also getting on the score-sheet. ended SuperSport United’s winning run in the Absa Premiership with a convincing 4-1 victory at Lucas Moripe Stadium in Atteridgeville on Wednesday evening. It was however the hosts who had the better of the opening exchanges, coming clos to scoring through Dove Wome’s 17th minute shot. There was also an opportunity wasted by SuperSport’s Sibusiso Khumalo, before Maritzburg went in front on 41minutes when Mandaza finished from close range after a Ashley Hartog assist. Virgil Vries then kept the Team of Choice in front when he made a fine save to deny Dino Ndlovu. But Matsatsantsa were back on level terms in the 50th minute when Lebo Manyama fired in a shot past Vries and off the underside of the crossbar. Mandaza put Maritzburg back in front just before the hour-mark when he headed in Khumubulani Banda's cross. Cele made it 3-1 in the 63rd minute with a goal from a tight angle after being played in by Mandaza, with Anas completing the victory on the 76th minute with virtually his first touch of the game after coming on as a sub.